I remember riding on the school bus in the fourth grade, getting popped in the back of my head with an automatic umbrella. Chris, a bully who was only one year my senior, would aim the umbrella behind my head, and press the button on the handle causing the bar of the umbrella to shoot forward, hitting me in the back of the head. It hurt. He did it repeatedly, laughing each time. I turned around and asked him to stop. He kept going. After repeated injuries, I walked to the front of the bus and told the driver. She did nothing. After countless times of being hit in the head and hearing the laughter of other kids, I felt helpless and angry. I was disappointed that although I wasn’t big enough or strong enough to make this boy stop, there was someone who could do something about it, but chose not to. The lady behind the oversized steering wheel who threw occasional glances into the overhead mirror to “watch” all the students did absolutely nothing. I’m sure we all have a story or two (or more) about bullying. Whether emotional or physical, bullying can leave scars long after the immediate traumatic event. It’s estimated that every seven minutes a child is bullied, and unfortunately, most kids never tell. I never told my parents about the events on the bus that day…and looking back I’m not sure why I didn’t. Similarly, most kids suffer in silence. Numerous children don’t have sufficient coping skills and they keep the negative feelings inside, often resulting in depression, anxiety and isolation. They start to miss additional days of school, withdraw from friends and family, and suffer from physical ailments such as stomachaches and headaches. Bullying is the number one reason for suicide amongst 11-16 year olds. It’s clear that something more must be done to protect our youth. Unfortunately, in 85% of bullying situations, there is no intervention of any kind. When someone does step in, 11% are attributed to peers stepping up to defend a friend. Only 4% of the interventions are from teachers or other adults. Here are some action steps we all can take as adults to both prevent and stop bullying. 1. Acknowledgment: I think we have to first acknowledge that bullying happens–far more than we’d ever want to admit. We have to stop being the ostrich in the sand, and be willing to face the fact that sometimes, it’s our child who’s doing the bullying, or maybe it’s our child/neighbor/friend/relative that’s suffering in silence. Approximately 43% of youth fear harassment in the bathroom at school. That’s unacceptable. 2. Ask and attend: Like any form of abuse, victims are often forced or coerced into silence. We need to ask our children directly if they are being bullied. In addition, we need to look for key signs that may indicate there is an issue: change in appetite or eating habits, loss of interest in school, worsening grades, difficulty going to sleep or staying asleep, frequent physical ailments that result in requests to stay home from school, sudden withdraw from family activities, change from happy and secure to moody and depressed, and increased anxiety. 3. Action: When you know bullying is taking place, the most hurtful thing you can do as an adult is to ignore or downplay it. Take action–talk to the bully’s parents, express your concern to your child’s teacher and administrators. In addition, act as a role model. Children learn how to treat others based on our actions, so demonstrate ways of expressing your anger without hurting others, and express your feelings when you have been treated poorly. 4. Advocacy: Regardless if bullying has impacted your child or not, there are countless children that suffer daily. It’s easy to point blame to others involved–teachers, administrators, other parents–but we all have to take responsibility for what we can do. Be a voice in your home, your business, church, and community to let people know that bullying is a form of abuse, and it has to stop now. Find an anti-bullying program to lead or participate in–research shows it reduces school violence by 50%. 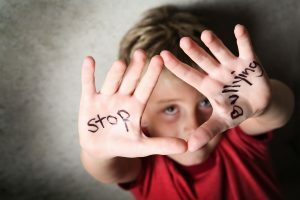 What are your experiences with bullying? How have you handled it when you or someone you know has been bullied, and what do you think can be done to stop bullying in our schools? I’d love to hear your thoughts.